The triple Barracks Reaper has become a mainstream opening now. I will discuss about the various variations and responses in this post. I consider the triple Barracks Reaper an opening and not a build. If you don’t understand the differences, you may want to read this article. There are two implications. The first is the choice to use triple Barracks Reaper does not vary based on opponent’s build. The second is it implies that there are varieties in the follow up. One variety is to put down two more Barracks for five Barracks Reaper, which I will discuss below later. This also explains why I discuss this article from the angle of “triple Barracks Reaper” and not the topical “five Barracks Reaper”. The triple Barracks Reaper I am discussing does not proxy the Barracks. This should not be considered a cheese. In my opinion, cheese has a high reliance on surprise, and this triple Barracks Reaper opening does not attempt to surprise the opponent. It is “in your face”. The above is the basic three Barracks Reaper opening. The Supply Depot and Barracks should be used to wall off the natural (see images below), as this allows you to expand safely behind the wall. There are three main variations, and I will discuss their build orders later. The main aim of this opening is to constantly apply pressure on Zerg, while you transition into a normal standard game with bio. Assuming both sides do not make a series of notable mistakes, it is unlikely for either side to win the game. Of course, mistakes are bound to happen in an intensive micro exchange, and one side should get an edge over the other as the game stabilises with the mid game composition takes the main stage. This style allows Terran to dictate how the early game is played, and Zerg are forced to make units instead of Drones in order to neutralise the Reapers. In order for this style to work, Terran must continuously be aggressive with the Reapers to deal damage, and it is important to focus fire the Queens when able. It is possible for Terran to deal significant damage once a few Queens are successfully picked off. More critically to the overall strategy, the Reapers need to delay Zerg from taking a third Hatchery for as long as possible, and prevent Zerg units from running out of their base. Consistent with the game plan to control the Zerg, creep tumors are also the prime target for the Reapers. In the vod below (timestamped), soO managed to have a bunch of Zerglings out in the map without taking significant damage, and Maru immediately played awkwardly. Maru had to rally his Barracks behind his wall to defend the Zerglings, and also to prevent the new Reapers to get picked off while they are travelling across the map. Also, the main group of Reapers did not make any aggressive move by attacking the Zerg, as the Zerglings might flank from the back. If Terran lose the main group of Reapers to Zerglings, they are in a very bad position. Therefore, the Reaper movement decisions made should not be just about piling up damage, it is also necessary to sustain proper map control. The priority to favor control over damage is evident when Zerg try to push out with units, as Terran will focus on catching the Zerg units instead of going into Zerg’s base. 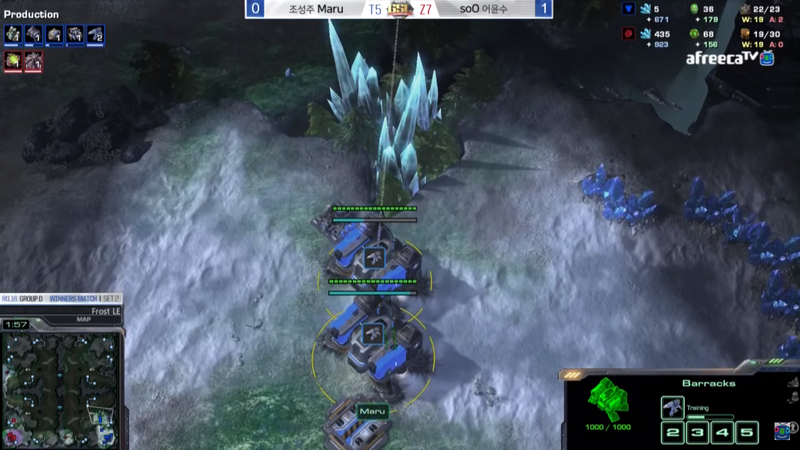 In the two vods below, Dark pushed across the map with early Roaches and Ravagers as a response to the triple Barracks Reaper, and Maru’s response was to pick the units off when they were moving toward his base. There are other notable details to this opening. It is rewarding to make a Marine or two to hunt down Overlords as you are producing Reapers. There is almost always an Overlord in Terran base to scout the transition timing, so that is an easy target. Moreover, Overlords are often spread across the maps in such a way that they give vision of the Reapers’ movement, and it could be rewarding to send the Marine around to hunt them down while the Reapers continue to do their job. Apart from the terrain, the grenades are key to the survival of the Reapers. This opening probably does not work without the grenades as the Reapers will get surrounded by Zerglings easily, and that is the end of it. The grenades make the interaction less one sided, it really stretches the skill ceiling of the early game. See the vod below to get a feel of it. It is likely that there are Reapers leftover when your transition to the standard bio composition is completed. They should not be sacrificed randomly by running into the mineral to trade for Drones, and instead be used as part of the main army when the first push occurs with Stim and Medivac. Their damage is often underestimated, and more importantly, the grenade can make it very difficult for Zerg to have a good engagement. Of course, if you have good multitasking skill, you can send a few Reapers to other mineral lines while you attack with the bio and the rest of the Reapers. See vod below (timestamped). There are three main variations after the opening. One is to build two more Barracks, and continue to produce more Reapers with five Barracks. This delays the transition to a typical bio and Medivac composition. The other is to put down a Factory earlier, and this allows a quicker transition. The third one is simply putting down an earlier third Command Centre. The first two variations will reach a point when you put down add-ons on the Barracks, and stop Reaper production for a transition. The timing may vary on the situation in the game. Also, since the add-ons stop production from the Barracks, you will bank up enough mineral to put down a third Command Centre around the same time. If you are confused about the different variations and how you can “remember” them, you should read this important article on convergent point. The below build orders are continued from the basic one above. You want to line up your Stim with the +1/+1, so you should put down add-ons once the upgrades start. The ratio of Tech Lab and Reactor may vary according to opponent’s composition, and importantly, you can choose to only put down one Tech Lab in order to not cut production. It is risky to put down five add-ons after you have lost some Reapers. Nevertheless, you should still have one Tech Lab at that timing in order to get Stim. The Marine (and Marauder) production transition should start when Stim starts, so in other words, stop making Reapers when Stim starts. The below vods are examples of this variation. This variation transitions out of Reapers early, and a good way to know when you should start the transition is the completion of the Supply Depot that pushes your max supply from 39 to 47. Subsequently, you transition to a standard game with two Engineering Bay for upgrades. The below vod is an example of this variation. Subsequently, you transition to a standard game with two Engineering Bay for upgrades. This variation is a metagame variation, as it is meant to take advantage on the fact that Zerg will overreact defensively against this opening. You have few Reapers to apply pressure, but you get an earlier third and first push with Stim. The below vod is an example of this variation. It is important to note that, Maru saw the Roaches and Ravagers moving across the map, so he cancelled the two Reactors to make more units. The choice to upgrade Concussive Shell first is meant to be a response against the Roaches. Broadly speaking, Zerg have three main types of response. The third Hatchery option is actually a game of micro for both sides, and I think neither has it “easier”. Zerg players have to make the right amount of units defensively, and attempt to catch the Reapers out of position to put down the third Hatchery. This option works better on maps where there are two possible third base locations, for example, Frost. In the first vod below, soO was able to sneak a bunch of Zerglings out on the map, and this forced the Reapers back (as discussed earlier). This gave soO the opportunity to take the third Hatchery when the Reapers were not circling at the entrance. In the second vod below, soO took an early third, and the timing of the Drone taking the third was just seconds before the first Reaper arrived. I actually think that Zerg players should Drone scout, and then hide that Drone somewhere to take the third Hatchery later. In the third vod below, it shows how it is a match of micro for both sides. I don’t think this is a good option. In fact, this may just be the outcome of multiple failed attempts to take a third Hatchery. There is no good option with a two base Lair. Mutalisks probably are not an option, as they require the Zerg player to save Larva and resources which is a luxury Zerg don’t have against this opening. Also, Terran have the tools at their disposal to prepare for the Mutalisks since there are already multiple Barracks. This can be done by putting down a Roach Warren early on, and cut Drone count to no more than 25. Thus, there will not be any Drone mining at the natural, and conversely, this is a telling sign for Terran that a Roach counter attack is imminent. In the first two vods below, Dark immediately put down a Roach Warren once the Overlord saw no wall off at the main ramp, as this is a sign that there are multiple Barracks at the natural. The counter attack is more effective when the Terran player has fewer Reapers, as you can see in the first vod below that Maru attempted to cut Reaper production for an early third Command Centre. 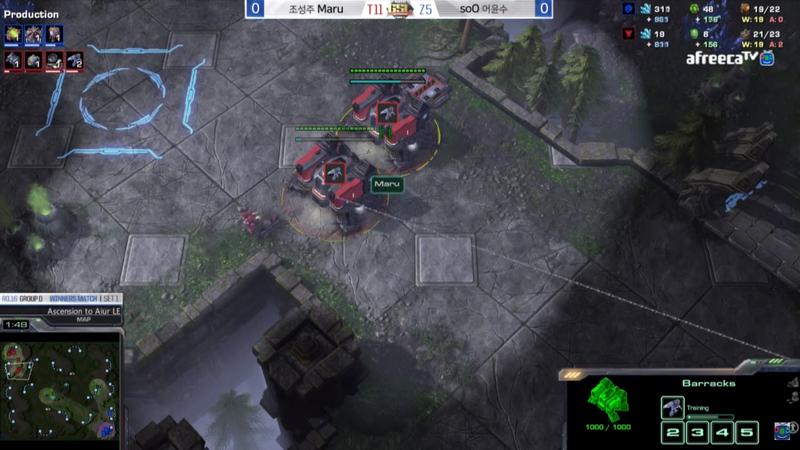 In the second vod below, the counter attack did not work well, because Maru was using the five Barracks variation. However, it is more than just a “variation counter”, as you can see in the third vod below that it is a matter of execution and map. This opening is not new, as we have already seen ByuN using it last year. It did not get that much attention because ByuN was the best player last year, and many thought that he could simply win with anything. Thus, his success with the triple Barracks Reaper opening was attributed to him and not the opening itself. However, since other Terran players are using it now, many shift the attribution to the opening. A logical way to judge whether this opening is overpowered as of current understanding is to look at the popularity and results. Generally, when an innovation is introduced into the metagame, the win rate will spike up as the receiving players have yet to figure out a way to deal with that. A perfect example is the 2-1-1 TvZ build last year. Zerg looked really lost at the start, but they had come up with different ways to play against it as time went by. Furthermore, 2-1-1 was adopted by every Terran player (i.e., popularity), and that showed the consensus that the build was indeed strong. This is not the case for triple Barracks Reaper, because the results are mixed. Although there are more players picking up the opening, it appears to be used as just one of the builds in these players’ arsenal. In my opinion, this is a nice addition to the match up from a broader metagame perspective. Both sides simply have a wide range of builds that are playable, and it shows how healthy the match up is right now. Thank you very much for such insightful article, Max. I’ve noticed this trend in Reapers lately and I KNEW you would talk about it!! Please, show some love for mech as well. You may have seen Gumiho style, did you find anything interesting to make an article about? There are some things that caught my attention. For example, Thor drop, which is something I saw INnoVation did in SSL finals.I will write something up if there are more talking points. This allows the third reaper to get to the opponents base quite a bit faster at what appears to be a very slight loss of economy. You’re absolutely right about giving priority to the Reaper. Hi thanks for your website its help me a lot and its by far the best wesite for terran. Thanks. As it stands now, I doubt I will cover broodwar the way I’m doing with lotv now, as I barely have enough time for one.